"Don’t compromise on your dreams and never give up. View any failure as a positive learning step taking you closer to achieving your dream"
Usha Arumugam combines a passion for client service excellence with an extensive knowledge of spas and holistic well-being. Educated at Oxford University, she was called to the State Bar of New York and qualified as an attorney at law. However, Usha decided to change direction and make her passion her business. After four meticulous years of research and refinement of her vision to create an authentic Malaysian-inspired day-spa in London, her concept was realised with the opening of Ushvani, her first major spa project. 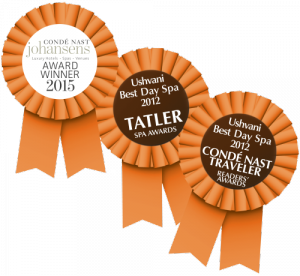 Ushvani is recognised as the city’s best luxury sanctuary and has won both Tatler’s award for Best Day Spa 2012 and Condé Nast Traveller’s Best Day Spa 2012. But probably the most satisfying comment from the press was that Ushvani have the best trained therapists in the world. Usha is continuing to develop Ushvani’s success through its range of naturally effective skincare products. Developed in-house with the utmost of integrity in both sourcing and efficacy, the product range is used for signature spa treatments and distributed at select, high-end retailers. Usha continues to strive for service excellence, traveling widely to research ideas, discovering ingredients and is focused on extending her exclusive, award-winning boutique spa brand further.